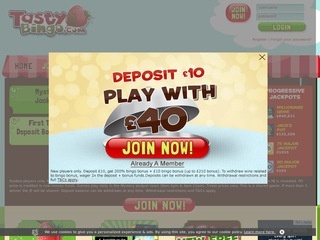 Tasty Bingo Casino will then reward you with a bonus (Welcome Bonus is for new players only). The terms and conditions of the bonuses vary between different casinos and might also change over time and between different countries, so it is important to compare the different offers and read the T&C for Tasty Bingo Casino before signing up. Who doesn’t like chocolate fondue? 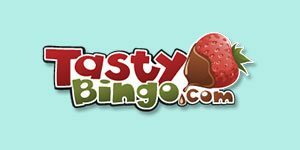 Tasty Bingo Casino loves pleasing its customers and presents itself with a succulent ruby-red strawberry covered in chocolate hanging from its logo. The layout and interface are attractive; the ambiance is warm and set with a grocery shop and its red awning, and a green field with trees in the spring. This Cassava Enterprises (Gibraltar) Limited operates under the rules of the UKGC and GBGA, it is well-arranged and organised and very easy to find your way around. With its lovable design, Tasty Bingo Casino is friendly and inviting, it loads fast and it is safe and secure, proven and verified by eCogra. Revolutionary in terms of the solid game offering taken that the venue primarily focuses on Bingo, Tasty Bingo Casino has a virtually all-encompassing portfolio of games that include casino games and video slots, jackpots, Bingo variants, Keno, scratch card games and more. The content is supplied by some of the greatest providers ever and the online casino is proud to show you what it’s got. If you saw ‘Bingo’ in the name of this establishment and thought there was nothing more than Bingo variants only, then hold your horses. The Tasty Bingo Casino shows off a litany of juicy video slots coming from exclusive providers and titles. The lobby is rich with thematic, branded and seasonal games, and the diapason of genres is embellished with action, thriller, romance, horror and the like. Some of the top tier games you can wager your hard earned money on include Luck o’ the Irish by Blueprint Gaming, Jingle Spin by NetEnt, and Love Island by Playtech. On board are also opulent progressive jackpots that could spin your life upside down! In comparison with most Bingo-dominated online gambling venues, Tasty Bingo Casino can truly be proud with its table game offering. It is plentiful and it is diverse – what most of us love to see. At Tasty Bingo Casino you revel in top notch games suc has European Roulette, Multi Hand Blackjack, Baccarat, Baccarat Pro Series, Low Stakes European Roulette, French Roulette, as well as a collection of premium games for VIP players. Moreover, this luscious online casino hosts some exclusive titles like The Clash of the Titans, which is a board game dedicated to the film of the same title and shapes it into the form of a video poker game. If Bingo is your forte, you can play on 75 Ball Bingo, 90 Ball Bingo and 5 Line bingo, plus a mass of mesmerising progressive Bingo jackpots! Cassava also caters for a number of scratch card games and instant games. As for an authentic live gambling experience online, visit Tasty Bingo Casino’s delicious Live Dealer section for infinite joy and entertainment! Play up against a real croupier in real time, as he or she deals for you game of choice. Thanks to the latest webcam technology and sound system, you will be able to enjoy the game as if the dealer were right there in front of you! At the moment you can enjoy live games such as Automatic Live Roulette and Live Roulette, but we hope the library grows in time. This promising online gambling venue has so much more to offer! As far as banking goes, there is nothing complicated about the matter. Much like most Cassava online casinos, Tasty Bingo Casino allows you to pay with all major ewallets, credit and debit cards, as well as using bank wire transfers, cheques and even the pay via phone service. The latter is available for UK players only, and exclusively for deposits. Ewallets at hand are Neteller, PayPal, Entropay, and Paysafe Card (again, the standard), whilst the cards you can pay with are Visa, MasterCard and Maestro. the accepted currencies are British pounds sterling, Euros, and American dollars. The general pending time is around 48 hours, and the fastest option to go for is PayPal. The quality offering and attractive looks are nicely wrapped up with the efficient customer support team. You can contact them via a range of communication methods. The most popular one among clients is the phone service, as it is free for all players calling from the United Kingdom (0800 2796 222). Gamblers from abroad can still call it, but be careful, as some hefty charges might be applied. The working hours of this service are between 10 am and 2 am CET. If you would like to avoid overcharged phone calls, try calling the international phone number +44 (0) 20 3794 3048. Lastly, there is a team of tem members who answer to your written enquiries. You can email them anytime around the clock at supp[email protected], and you will get a reply as soon as possible.